The day started at the Victoria and Albert Museum for Tomorrow an installation by Elmgreen & Dragset. 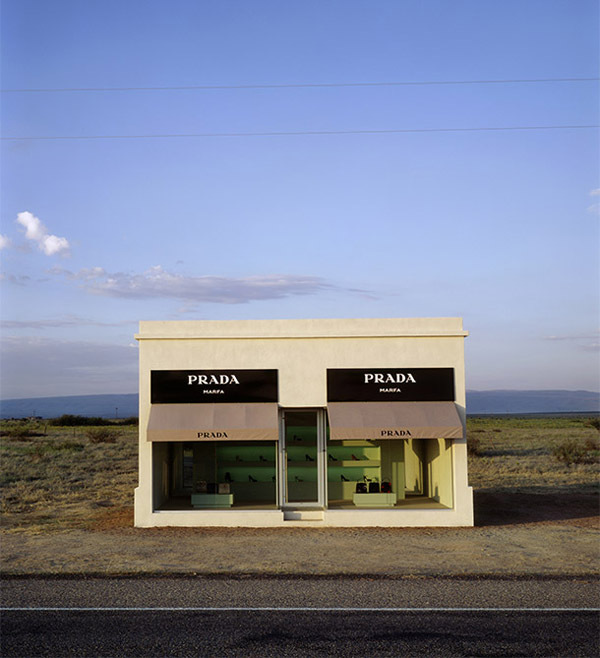 Should you not be familiar with the artists’ names, you may have encountered the work of the duo Michael Elmgreen and Ingar Dragset either because you were wondering who decided to build a Prada outlet in the Texan desert or because you enjoyed that playful little boy on his rocking horse on Trafalgar Square. The V&A exhibition is an experience more than it is a visit. V&A has commissioned the artists to create a major site-specific installation in the former Textile Galleries. The apartment-like setting is the set to an unrealised play, the script of which you can read cosily within the set. Elmgreen & Dragset: The Installation. Courtesy the Artists and Victoria Miro, London. © Elmgreen & Dragset. One is then more and more drawn to the details of the installation making the whole experience an intriguing questioning of the status of space and surroundings. I then found myself at Le Meridien on Picadilly that was hosting a performance by Pil & Galia Kollectiv, A Guide to Office Clerical Time Standards. The performance piece is based on a corporate manual from 1960 that focused n the time necessary for the accomplishment of minute labour procedures in the office. Seven performers represent the different levels of management and employment: clerical workers / middle management / senior management. A screen behind them describe the tasks that each group is assigned. 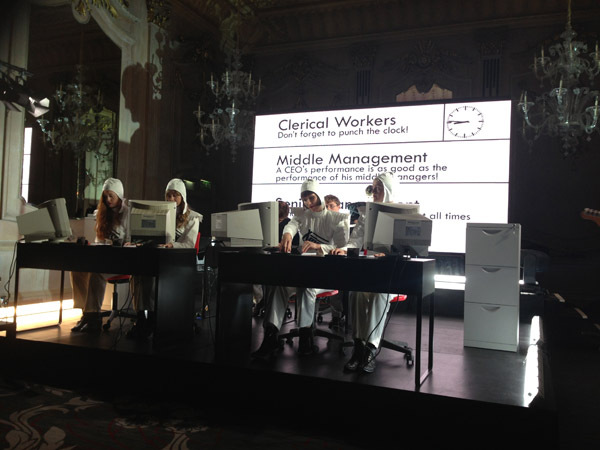 Although exploring the post-Fordist service sector jobs, the performance made the clerical workers’ activities look like a revival of Modern Times by Charlie Chaplin. The middle management role is questionable especially when “Designing and implementing reward systems” seem to equate congratulating each other. The music has an important role making the rythm of the clerical workers’ day quite clear bringing us from stress to numbness. Performance art being to me quite an interactive form of art, I wondered at some point if the interaction was with the audience was through the music. Partly yes but then I realised that the set was pyramidal with one senior manager, two middle managers, four clerical workers and the base was the audience. So whatever we were thinking of the performers deplorable condition our passive role as consumers of the show made us the accomplice of this corporate machine. On to the Institute of Contemporary Art for the preview of Zhang Enli’s Space Painting. The Shangai-based artist has transformed the ICA Theatre in one of his all-encompassing Space Paintings. Having been so impressed by the intensity drawn out of colour by Paul Klee on small scale paintings, I walked through the theatre rather not moved by the work. It does draw the attention on the materiality of the room that has become different through the artist’s intervention but in a less radical way than I had imagined based on images I saw of his previous installations. 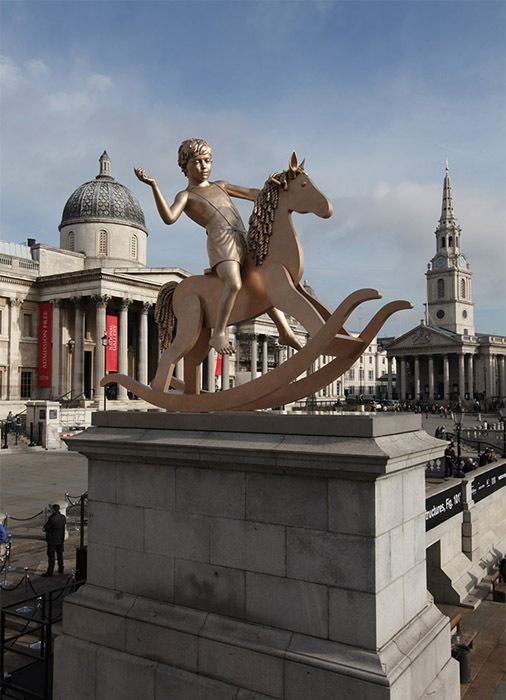 I then went to see Thinking BIG, the exhibition of monumental sculptures and installations to be sold at auction by Christie’s to benefit the Saatchi Gallery’s foundation. Here are my picks that are works that I felt were not big just for the sake of it or interesting just because their scale made them impressive. An interesting fact is that All works are for sale with no estimates or reserves as a one off for this auction only. In consideration of the scale, it will also be interesting to see if only or mostly institutions will bid or to detect who are the collectors who have the appetite for museum like artworks. The day ended with the opening of Frieze Masters, the well-named. The fair features leading galleries showcasing art made before the year 2000, ranging from the ancient era and old masters to the late 20th century. 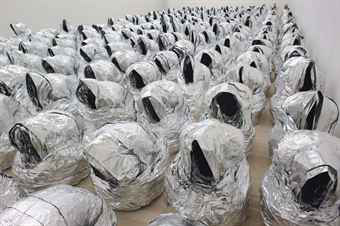 Unlike Frieze that opens today, Frieze Masters has more exhibitors than last year. The fair remains nevertheless manageable. Acquavella Galleries (stand E1) at the entrance gives the tone of the overall fair with works by Picasso, Basquiat, Bacon, Twombly or Franz Kline. 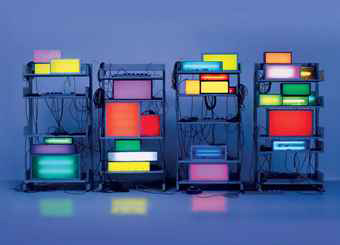 More ‘modest’ collectors might shy away the impressive art selection that that is overall worth over USD 2bn. Aside from the Spotlight section dedicated to solo presentation, a number of galleries opted for this format like Thomas Gibson with Matisse (stand F3), Tornabuoni with Fontana (stand A6) or Galerie Gmurzynska (stand B7). As far as old masters are concerned, you can discover works by Rubens at Salomon Lilian (stand B11) or Arcimboldo at Koetser Gallery (stand A5). I thought that Robilant + Voena (stand A3) was one of the galleries who took the concept of the fair the furthest presenting on a wall works by Fontana, Matisse and Bardini alongside Gericault. 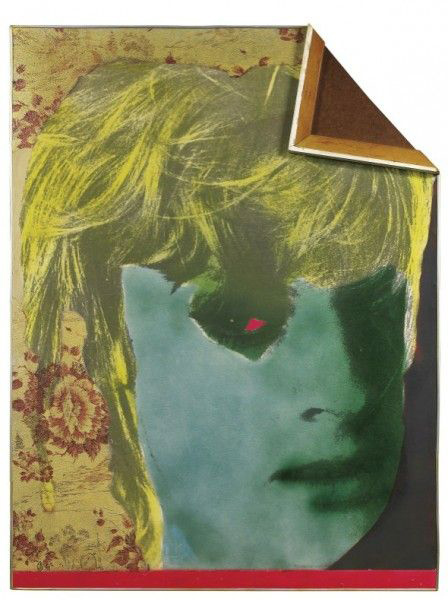 I particularly liked the Tableau Casse by Martial Raysse at Luxembourg & Dayan (stand C9 – image below). An interesting full report on the fair has been written by The Arts Newspaper. 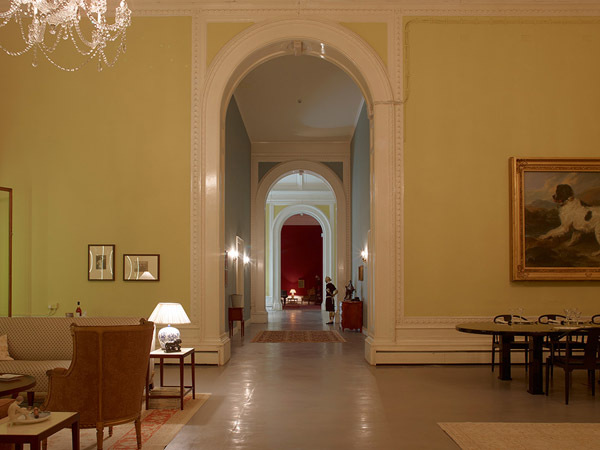 Frieze Masters, Regent’s Park, until October 20th, 2013.